My second thought is that the war was primarily caused by Empires. Though one small state, Serbia, was involved in the casus belli, the impetus for war came from the Imperial powers of the day. They were fearful of each other and were if anything, even more fearful of the threat from within. The growing demand from subject peoples for greater self government was a constant threat to the survival of Empires. They, the great imperial powers of Europe – Germany, Austria-Hungary, Russia, France and the British and Ottoman Empires – were all willing to go to war to preserve their empires. War was seen as an acceptable, indeed noble, way to maintain power and influence. This leads on to my third point of reflection. Not only was the war caused by these Empires, the war was primarily fought by these same Empires. Many smaller countries in Europe and subject peoples in other parts of the world were drawn into this war, but it remained a bloody struggle for supremacy amongst Empires. My fourth point is that all of the main participants lost to a greater or lesser extent. Though the Franco-British alliance, with the indispensable assistance of the USA, eventually won on the battlefield, they were so weakened as to make this a most bitter victory. Within 50 years even the French and British Empires would cease to exist in the same way as the German, Austro-Hungarian, Russian and Ottoman Empires, which all collapsed in 1918. The only long term victor was perhaps the USA, not something any of the European powers anticipated nor wanted. The fifth point that strikes me is that the war resolved nothing. Some Empires disappeared for good, others lost but survived in a truncated form, while some got bigger, but only for a short period. But the fundamental issues around imperial rivalry and self-government were not in any sense resolved and the world, particularly the rest of the world, remained much the same. It was the Second World War which finally resolved many of the key issues, by bringing about a new balance of power in Europe and most of the rest of the world. My sixth point of reflection is that though many of the underlying issues remained, the war did bring about enormous change. In particular the post war map of Europe looked very different. Many new independent countries emerged from the war. Finland, Estonia, Latvia, Lithuania, Poland, Czechoslovakia and Yugoslavia were all recognized as independent countries. The uncertain and difficult future which awaited all these countries was to illustrate just how little the war had resolved many of the underlying conflicts, in particular the right to self-determination. Even the UK was not untouched by the creation of new countries. Though little is said about it now, it was during the First World War that the seeds for the first break-up of the UK were sown. The bloody uprising of Easter 1916 was to be the precursor for the formation of what is now the independent Republic of Ireland. Shortly after the end of that war the UK itself had become a truncated state. A seventh point would be that most of the continuing problems in the Middle East can be traced directly back to the insistence by the British and the French to deny the peoples liberated from Ottoman rule the right of self-determination. In particular the Israel/Palestine conflict has only developed because the British were powerful enough to impose their rule over most of the Arab world. With this came the commitment to create a Jewish state in Palestine, against the wishes of the Palestinian inhabitants. 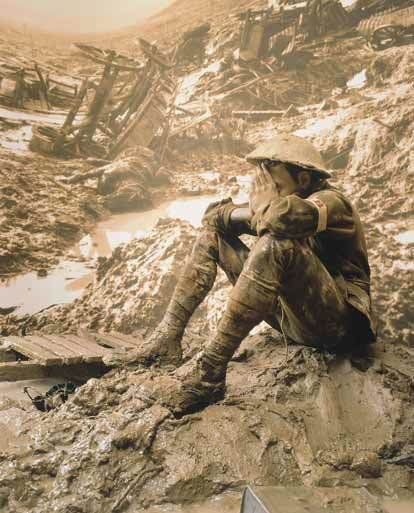 My final point for reflection is that the mess that was the First World War and the legacy it left behind is a direct product of the Victorian and Edwardian ages that our elites seem so keen to extoll. We badly need a serious re-evaluation of that period and how its inequalities and iniquities helped create the conditions for the First World War.